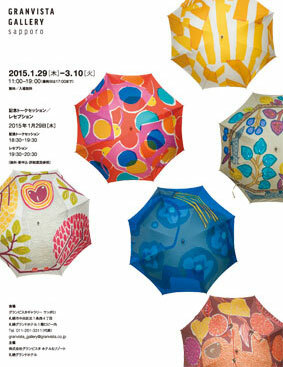 From January 29th, “Masaru Suzuki’s Textile Exhibition” started at Granvista Gallery Sapporo. Masaru Suzuki is a textile designer, and UNIQLO T-shirts(UT) are fresh in our mind that he designed and cooperated with Moomins in 2014, a popular character in the world. And also he has been joined Autumn Winter collection at marimmeko. He is one of the textile designer that has received the most attention. He says “there are excitement and joy to choose things, and born is like a driving force for people and things move forward” by the colors and patterns in textiles. And continues “OTTAIPNU, the original brand I busily make, develops with the theme of textile products that will raise the mood of people while wasteful present”. It is the first landing exhibition in Hokkaido, please enjoy so much. Till March 10th.